Wow! Just, wow! How's that for a review? Well, it's definitely how I felt about the new book by author Jay J. Falconer, Shadow Games: Time Jumper Series Volume One. This story is a real roller coaster of a ride of action, adventure and excitement, all wrapped up in the paranormal environment, and was a book that I had a hard time putting down once I started it. The story of lead character Emily Heart begins, a fifteen-year-old girl who has realized that she has changed, and not just in the ways that any young person changes in adolescence. Someone or something has turned her into a time jumper, and she isn't sure how or why. What she does know is that her best bet is to keep herself and her ability hidden, and to find the entity that altered her so that she can demand to know why. Will Emily be able to control her unique abilities enough to do just that or will she be found first? That is the question! I loved Shadow Games. Loved. It. How's that for a review. I was sucked into this story almost from the very first page and I could not put the book down until it was done. Author Jay J. Falconer has a true gift in writing in the paranormal genre and has provided his readers with a creative and unique story that is unlike any they have read before. His characterizations are vivid, his world creation skills are simply second to none, and his ability to write a suspenseful, edge of your seat kind of tale is fantastic! It's easy for me to give this book my highest recommendation, and I very much look forward to reading more in this incredibly promising series by author Jay J. Falconer in the near future. In an excellent new entry into the genre of paranormal fiction for young adults, Shadow Games: Book One of the Time Jumper Series by Jay J. Falconer will grab readers from the very first pages and keep them obsessively reading all the way through until the very end. Follow the story of fifteen-year-old Emily Heart, a young woman who is definitely not the norm. She is not the same genetically as other young women, but the strangest part is that isn't the way she was born. Her genetic code was somehow twisted to change her, and Emily isn't sure by whom. Now she's living her life on the run, and hell-bent on revenge against whoever it was that put her in this position. Will Emily discover the source of all of her problems, or will she be found first? You'll need to read the book to find out! I very much enjoyed Shadow Games. Author Jay J. Falconer has done a great job in creating a story line that is exciting, fast paced, and unique. It's a joy to read a book in this genre that isn't like every other book you've already read, and the author has definitely provided that here. The characters, especially Emily, are written so that readers will be able to relate to them, will care about them, and will continue to think of them long after the book is finished. If that isn't a hallmark of a great author, I'm not sure what is. 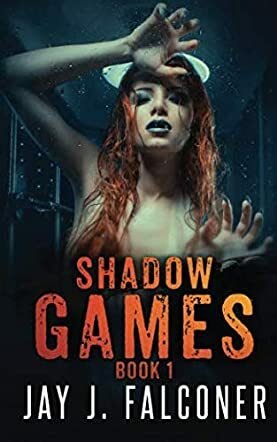 I highly recommend Shadow Games to any reader who enjoys paranormal fiction, whether young adult or not, and I certainly look forward to reading more from the obviously talented author, Jay J. Falconer, as soon as I possibly can!